What is another word for condemnation? The act of condemning; the act of declaring one guilty; the cause or reason for condemning. imposition, stigma, termination, disagreement, censorship. 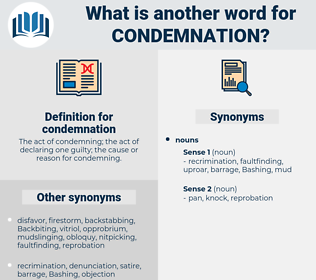 condemn, condemning, condemns, condemned, convicted, sentence. 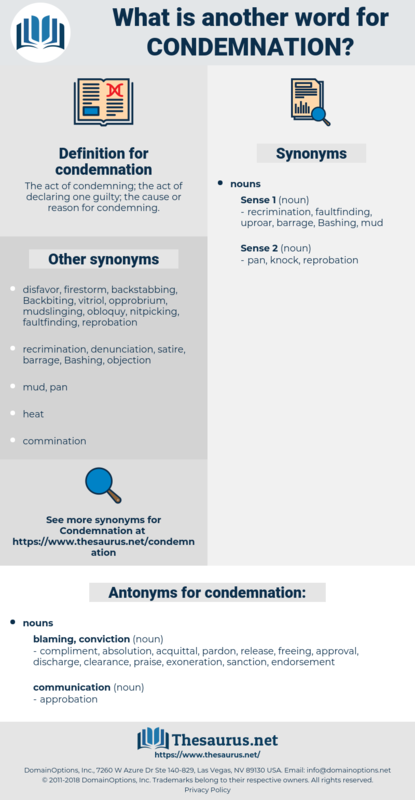 disapproval, repudiation, reprimand, rejection, revulsion, censure, criticism, convict, abhorrence, indignation, condemning, verdict, complaint, punishment, condemned, judgment, convicted, stigmatization, judgement, disgust, penalty, prosecution, reproach, penalization, sentence, guilt, repulsion, outrage. compliment, absolution, acquittal, pardon, release, freeing, approval, discharge, clearance, praise, exoneration, sanction, endorsement. Poor Graeme was relentless in his self - condemnation as he told how, through his 'cursed folly, ' old Nelson was killed. You must not look condemnation at your Louy for that.